Review: My most worn scents! Ricci Ricci - This perfume has a spicy, musky scent to it. But once rubbed in the skin, the scent softens. This perfume lasts for hours, and the bonus part is you don't have to spray so much to get this result. (Which is handy as even a 30ml bottle is pricey.) The scented lotion I find doesn't actually smell as similar to the perfume, it seems a lot sweeter. I loved wearing this throughout winter due to the strong smell, as the scent felt warm and cosy. Nina - This has a much softer scent to it, with a hint of spice but much more fruity. Which I like because it balances it out. I don't find that the scent lasts as long as Ricci Ricci, and you do have to spray a little bit more on you, but none the less this has still become one of my favourites. I use this perfume for nights out with the girls and going on dates with the boyfriend. The lotion I find smells exactly like the perfume, which helps keep the scent going on longer if applied before hand. I feel this is the perfect scent to wear in spring! Lady Million - I am a fan of Pacco Rabanne, and Lady Million was the first perfume I found addictive (before I found out about Nina Ricci). To me Lady Million is such a feminine scent, sort of fruity although as far as I'm aware it doesn't contain any fruity scents. The perfume is long lasting and I received many compliments when wearing this. For some reason, I found this to be much nicer scent for a warm/summery day. I've only recently purchased 'Circus Fantasy' and 'Vintage Love', and am still in need of using. I can tell Vintage Love will more than likely be the perfume I'll carry in my purse for quickly sprucing up. 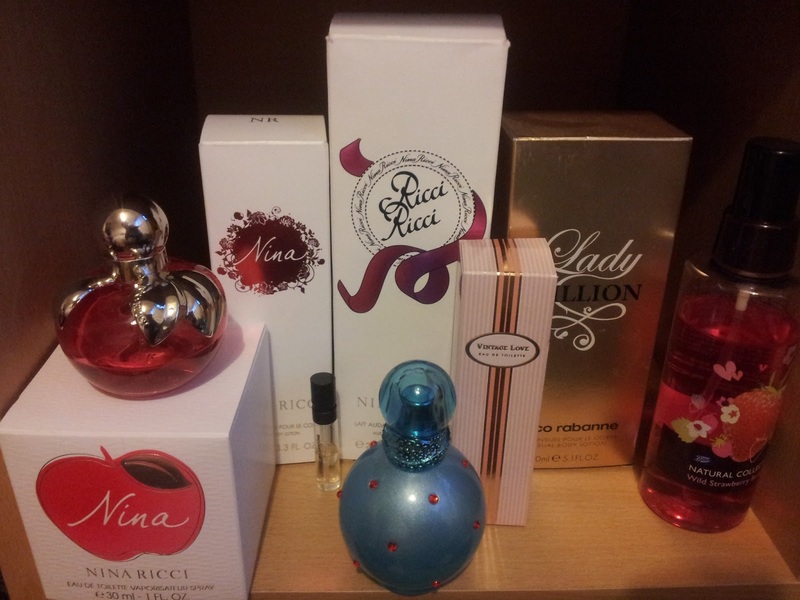 What's your favourite perfumes? Have you got any recommendations for me as I love finding new scents?